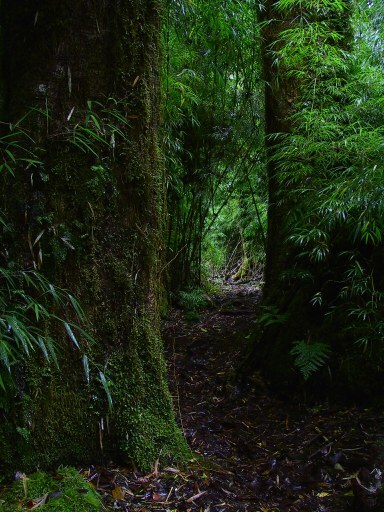 A winding trail through the rain forest. 3/22/2002; 42º54' south- Pumalìn Park, Chile; Short hikes. Well, the bus to Futaleufù was broken down today, so I opted to join a tour group led by Nicolas of Chaitur (a local tour operator) to Pumalìn Park. Along with Mandy there was a couple from Washington DC, another couple from Buenos Aires, an Englishman and myself. We left Chaiten around noon and headed north up the Carretera Austral. 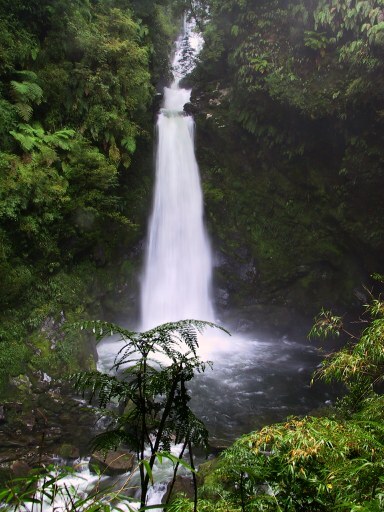 Pumalìn Park is the vision of Douglas Tompkins, a long time visitor to Chile from north america. In 1991 he bought the 42,500 acre Reñihuè Ranch north of Chaiten for the purpose of setting aside the area as a wilderness protected from exploitation. Since then he and his wife have purchased an aditional 750,000 acres adjacent to the ranch to comprise the current park. The project has met with considerable political concern, some fearing that the large park would divide Chile (indeed, it covers all of the land from the ocean to the Argentine border), and others who wanted to exploit the natural resourses. The land will be donated to the Chilean Fundaciòn Pumalìn for administration and development as a national park under private initiative. Our first hike was up to the Cascadas Escondidas, two beutiful waterfalls. Hiking in the rain forest tends to be a bit wet. So wet that when the trail was not mud, one's boots would actually squeek on the ground (like ski boots on snow). The trails in Pumalìn are quite well maintained, with wood boardwalks and ladders in the muddy areas (that would be just about all of the trail). After half an hour of squeeking along we arrived at the lower waterfall, which was accessed by wooden ladders and stairs descending a steep hillside. The water seemed to spout directly out of the forest above, falling 50 feet and landing in a crystalin pool below, then draining out and disapearing into the forest once again. A streem and Alerces trees in Pumalìn Park. 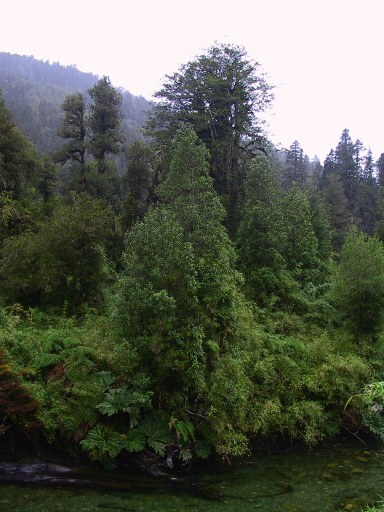 Pumalìn is the southernmost extent of the range of the Alerce trees in Chile. Alerces are in the same family as the redwoods of California, and one of the primary goals of the park is to protect the remaining Alerces. 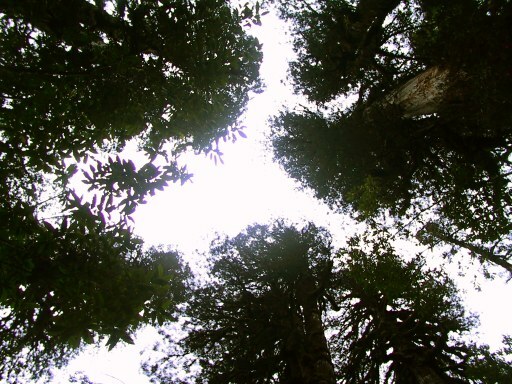 Only 15% of the original Alerces trees remain in Chile, the other 85% having been used for housing and boatbuilding. Our second hike was on a nice trail through a large grove of Alerce trees, some of them as old as 2,000 years. Alerce have been known to age in excess of 3,000 years, making them the second oldest tree on earth next to the white pine in California. A wide variety of other trees and plants grow in Pumalìn, and it is typical to see as many as 10 different species of trees standing next to each other. 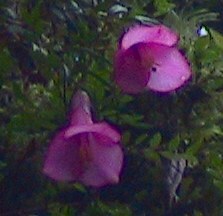 The white flowers of the Ulmo tree yeald an especially sweet honey, and one of the projects in the park is bee keeping. Meil de Ulmo is the best honey that I have tasted. Coicopihue flowers growing on the side of an Alerce tree. Our last stop of the day was the Cafe at Caleta Gonzalo, where the road ends in a bay. During the high season a ferry runs every once in a while, connecting with the Carratera Austral once again on the north side of the bay. The Cafe was cozy, with plenty of hot tea, home made bread and meil de Ulmo. Nicolas met some friends there from Puerto Montt, and after talking a bit they started singing and Nicolas pulled out his Charango (an andean instrument which looks like a mini-guitar), and an hour long jam session ensued. Nicolas turns out to be quite the Charango player, and it was great fun to listen to traditional songs of the andes, songs written by his friends, and even a bit of John Denver thrown in. All in all a great day in a beutiful park.